Condominiums typically have an overall insurance policy covering the building but it’s nonetheless still important for individual condo owners to look into their own policies. Shared insurance doesn’t cover personal belongings, for example, or other costs that an owner could incur in the case of an emergency. 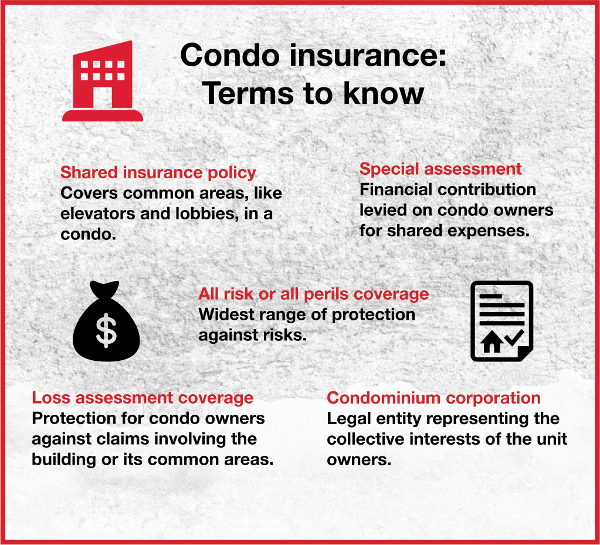 Insurance is particularly noteworthy when it comes to special assessments, a levy or financial contribution that can be imposed on condo unit owners. Usually, special assessments and other costs like strata fees are explained and disclosed at the time of purchase. In the case of an emergency though, a special levy can be announced — usually after a strata vote. This money is collected in instances, for example, where the shared insurance policy doesn’t cover the full cost of the damage and can add up quickly for condo owners. Loss of assessment coverage can mitigate this. It’s not unheard of to hear horror stories of condo buyers getting stuck with special assessments after they’ve bought their unit. Title insurance protects buyers against several risks, including situations like this where special assessments crop up that were not disclosed at the time of purchase. This kind of insurance covers the condo owners’ portion of any special assessment. It’s also possible to get insurance that specifically covers special assessments. Problems can come up where this is needed, for example, when a condominium corporation faces a crisis where its own insurance policy isn’t sufficient enough to cover the costs and so a levy is collected. Special assessment insurance covers the owner in this case. These are just two examples of insurance that can cover an unexpected special assessment. Dozens of other policies exist to cover personal items and other costs, sometimes even moving costs or unexpected living costs. Know how you are covered by your insurance so you can fill in any gaps as needed for full protection and peace of mind.